Let's give a SHOUT OUT to our students or co-workers! 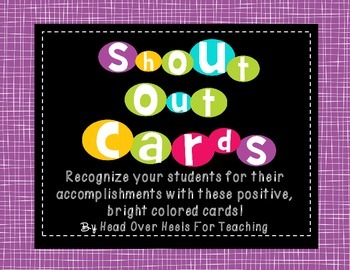 Recognize your students or staff with these fun and positive shout out cards! 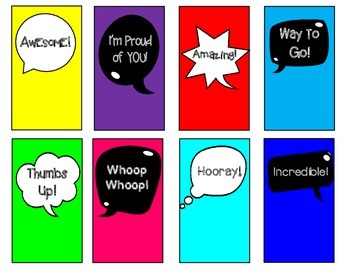 *46 different cards to positively praise your students! 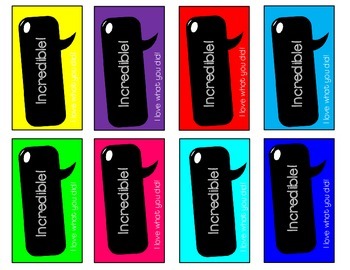 *23 pages of brightly colored cards to hand out to students, your own children, or staff members! 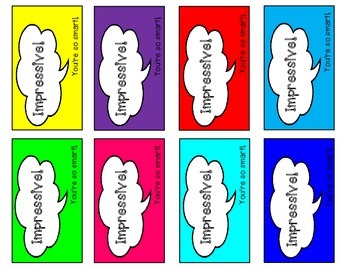 *23 pages of black & white version shout cards too! *There's one full page of 8 shout outs to match "trinkets" if you'd like to accompany the card with a goodie. For example: You Rock (rock), You Make Me Smile (smiley sticker), You're Sharp (pencil), You're on the Mark (bookmark), etc. *Perfect for all grade levels and staff!! I’d love for you to stop by my blog! *Thank you for visiting my store! Want to know when I add a new product or freebie? Please click "follow me" at the top of this page and you will receive an alert. Thanks for stopping by! Copying for more than one teacher, classroom, department, school, or school system is prohibited. The product may not be distributed or displayed digitally for public view without written permission of the author.